Webster defines language as, “The suggestion by objects, actions, or conditions of associated ideas or feelings”. The baking, making and presenting of food most assuredly are actions that can be associated with ideas and feelings. Am I right? Comfort food alone seems to prove my theory. Don’t you think back to being a kid in your mother, grandmother or aunt’s kitchen feeling surrounded by aromas which entered your soul and fed your heart? Glorious smells of coffee, bacon, bread baking and soups simmering can bring most people right back in time and cradle them with warmth and contentedness. My nineteenth wedding anniversary was Tuesday, and all day Monday I kept contemplating what to make for breakfast, knowing that I had so much to say to my husband with my food. What could I possibly make to say everything buzzing around in my heart and mind? And better yet, how on earth could I whip it up by oh–let’s say 7:15am when we needed to convene for the morning and rush along on our workdays. I’m sure those of you who are following this blog are shouting on the top of your lungs for those Red Velvet Pancakes…I mean what says love more than bright red pancakes laced with little bits of bittersweet chocolate? But, no, that did not quite fit the bill. I needed something homey and warm, sweet and soft. 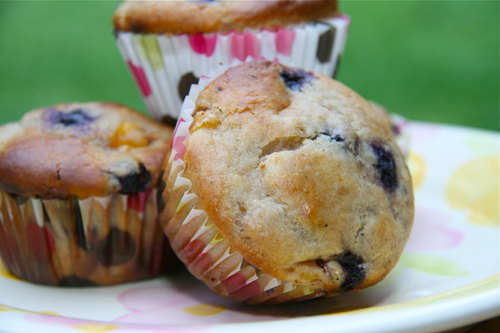 At the eleventh hour…actually 6am on Tuesday, I had arrived at my decision; peach, blueberry muffins with scrambled eggs. To me this satisfied my message better than any card. Marriage can be sweet, a little tart at times, but if it is done exactly right, like my muffin was going to be, it is tender, soft and warm. I did not have a recipe for this muffin and did not want to wake him up by turning on our computer so I decided for the first time ever, on a most important occasion, to wing it. Baking is the enemy of winging it I have been told…after all it is an exact science. I made it up as I went along using nonfat yogurt to create a slightly tart but very tender crumb, a little wheat flour for sturdiness and the rest is pretty usual. My daughter made scrambled eggs which I figure is symbolic of the semi-chaos of a busy house of kids, teens and pets. Do you know that this muffin was actually exactly right in every way? As I think about this lovely peach and blueberry muffin and my private language of food, I think about my message it sent and hope it was appropriately translated so that my husband could know all of the things I could not put into words. 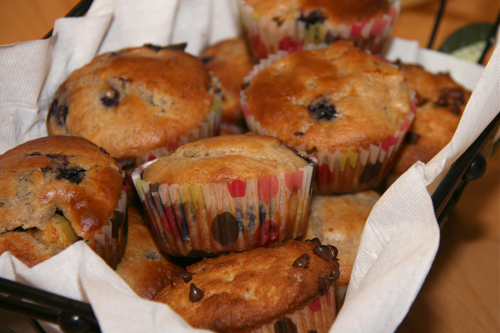 Preheat your oven to 350 degrees, and fill your muffin pan with paper liners. Put the dry ingredients, flour through cinnamon, in a large mixing bowl and whisk together to avoid sifting. In a separate bowl, measure the liquid ingredients, buttermilk through oil, and stir to combine. Add the sugars to the liquid ingredients and then combine both the dry ingredients with the wet, folding them together with a rubber spatula. 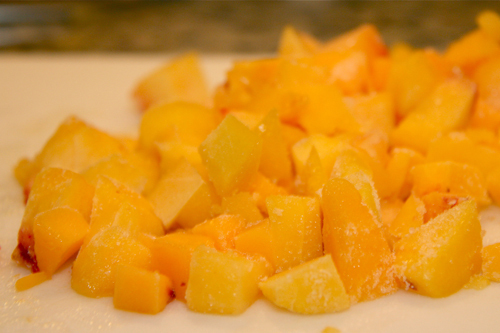 Gently fold in the chopped peaches and blueberries, being careful not to mush the blueberries. Fill each muffin cup 3/4 full and bake for 20 minutes until golden brown and a toothpick comes out clean when testing it. These are lovely. I think there are lots of different languages for love. Music, words, art, and… food. This is a great post. I enjoyed “thinking” my way through it. Yes, I do think that food reflects more than a plate filled with edibles. I am glad you could make your muffins to express yourself. Your muffin cups match your muffins beautiful. They add to the mood.